The above prices are exclusive of Canadian GST, HST and PST tax rates and exclusive of shipping & handling costs, and exclusive of shipping & handling charges, taxes, and possible customs duties and custom brokerage fees in case the painting has to be shipped to a country outside Canada. 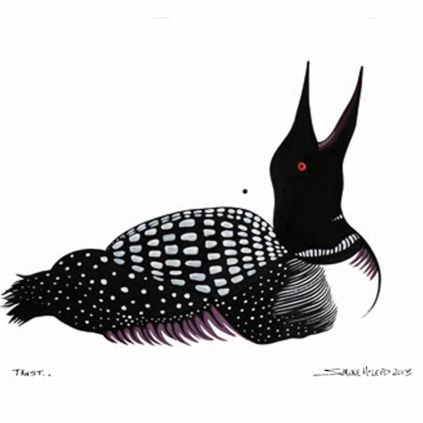 This print, which is based on an acrylic on paper titled Apenimowin (which is the Ojibwe word for trust, or confidence), depicts the spirit of Maang (loon), who is the totemic patron of Dimii'gamiwewidang (He Whose Voice Resounds Across The Lake), an old Anishinaabe ogimaa (chief), member of Maang Doodem (the Ojibwe Loon clan). Dimii'gamiwewidang, sensing he will soon be united with his forebears, paddles his wiigwaasi-jiimaan (birch bark canoe) across the tranquil, transparent water of Gichigami, the Great Lake.